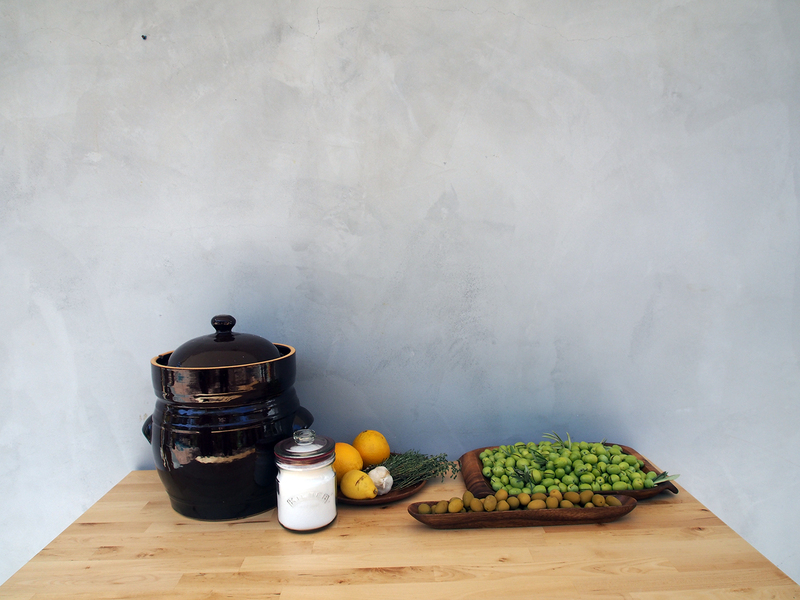 Ever since we brought in our line of fermenting crocks, we’ve been absolutely obsessing over curing our own olives. Why? Because olives are delicious and versatile. They’re great on cheese plates, amazing in cocktails, and SO good on their own as a snack. Plus, they’re high in antioxidants and vitamin E. Can’t hurt, right? So when olives finally came into season here, we bought ourselves a ton of raw, uncured olives and got to experimenting. 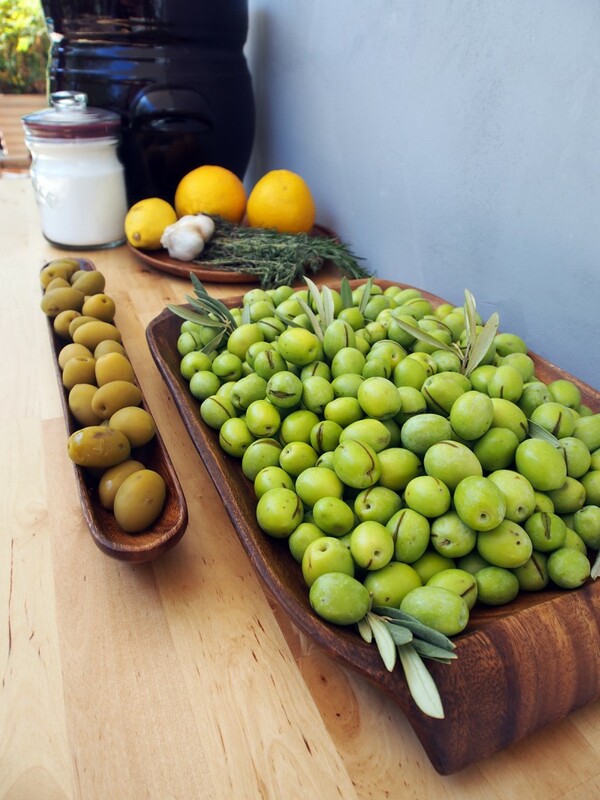 Here’s a little thing about olives: when they’re uncured, they don’t taste good at all. In fact, they taste downright nasty. I think that cured olives had to be born out of desperation, since no one in their right mind would bite into and uncured olive and go, “Oh hey, let’s eat this.” They’re bitter. Another thing about olives: green and black olives can come from the same plant. The green olives are unripe and the black olives are ripe. As you can see, we used green olives in our experiment, and we took a slightly unorthodox approach – we cured the olives like we’ve cured cabbage for sauerkraut in the past. Put it in a crock packed with salt and seasoning and let it lacto-ferment. It seemed like a logical choice – less labor intensive than brine curing and less potential for chemical burns than lye curing. Ready for the details? Let’s learn how to cure olives. Prep your olives. Pit them or cut a slit in the side of each to help them absorb the brine. Some recipes even suggest hitting them with a hammer. However you break them up, make sure you drop them right in a container of water or the spot that’s cut will oxidize, as some of ours did in the photo. This isn’t a bad thing flavorwise, but it’s not pretty. 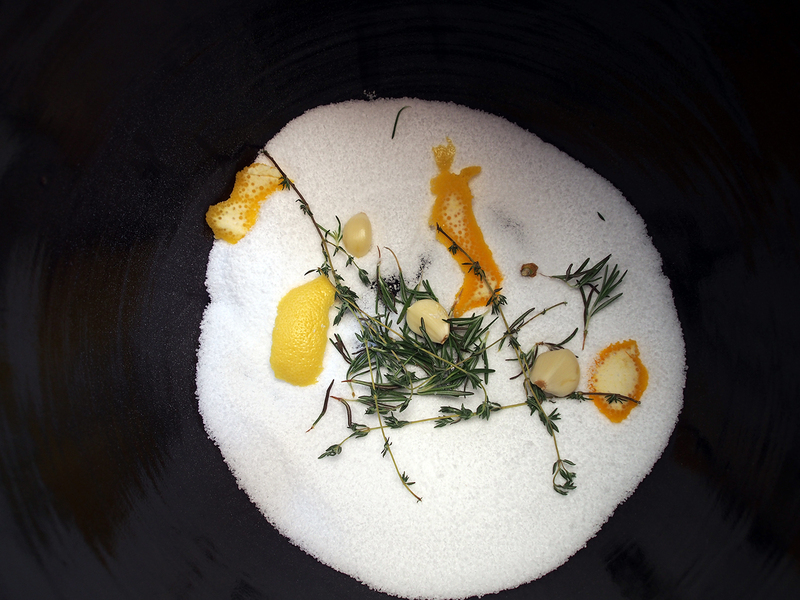 Toss your seasonings in with your salt. Get your hands in there and really rub everything together. You’ll have a crazy aromatic salt mixture, and you’ll find yourself very aware of any little cuts, nicks or scrapes on your hands. They’ll seriously burn. 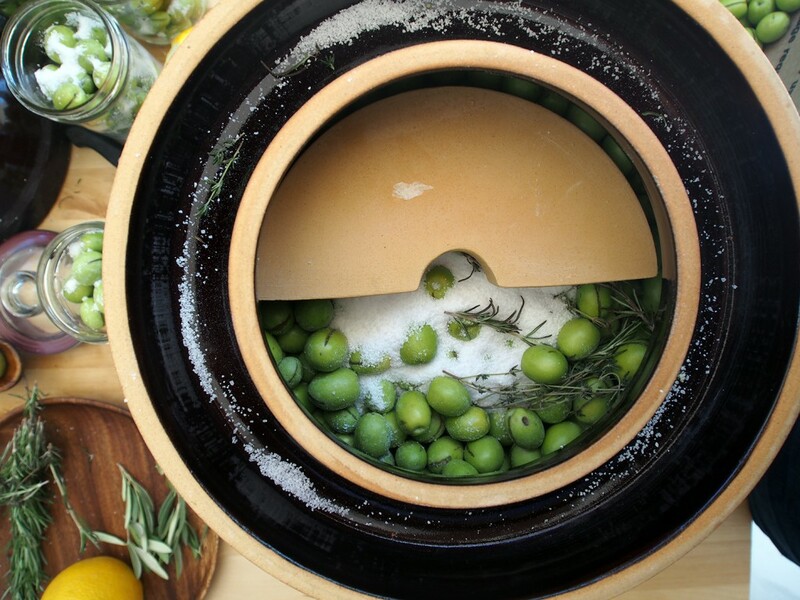 Add some of the salt mixture to the bottom of your crock and begin packing in the olives as tightly as possible. Once you’ve packed in about 1/4 of the olives, sprinkle about 1/4 of the remaining salt mixture. Repeat until all the olives and salt are in the crock. Pop the stones on top of your olives. Fill the water well seal and leave them alone, in a cool place, for a day. After 24 hours, check to see how much brine they’ve made (by naturally releasing juice.) If the brine is covering the olives, leave them alone. If not, and it probably won’t be quite there, add filtered water until it covers the olives and the stones by at least a couple inches. Leave your crock in a cool dark place where it can sit for a couple of months. That’s right, you’re in it for the long haul. Check the brine level every week to make sure they’re still covered. After about 3 weeks, open the crock, taste the olives (chances are they’ll still be bitter.) If they’re not to your liking yet, simply check the water level on your olives to keep the fruit and the stones covered, and leave them alone. Check every week or so. Ours have been in the crock about 8 weeks and they’re FINALLY getting good! 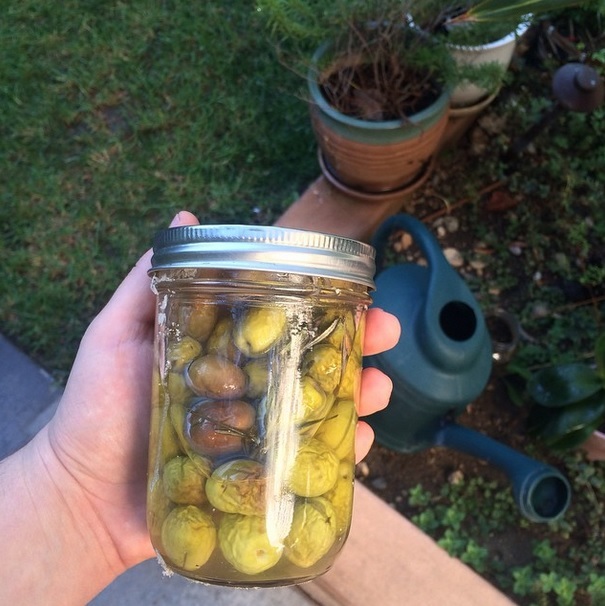 Once you’re happy with the way the olives taste, it’s time to transfer them into canning jars. You could store them for up to a year in their brine in a cool dark place. You can also can them in jars with fresh brine (1/4 cup salt to every quart of water.) If you’re doing that, make sure to leave about an inch of head room in the jars for any gas that may try to escape. My favorite way to store fresh cured olives is to pack them into large jars and submerge them in hot, fresh olive oil. I use lower quality olive oil for this, heat it, and pour it straight on top of the olives, leaving about an inch of headroom. The olives, which wrinkle slightly during the curing process seem to plump back up, and at the end of the day I also have this amazingly flavored olive oil to use. It’s great in a salad dressing or as a dip for bread. I also love it in my pesto. Once these olives have cooled, I either store them in a cool, dark place for up to a month or my fridge. Or I give them as gifts. A Jar of Cured Olives! Well, there you have it. You’ve learned how to cure olives. Like so many things, it’s more time consuming than it is difficult. But the finished product is SO worth it! Plus, you can actually say you made them yourself. Who makes their own olives, seriously? 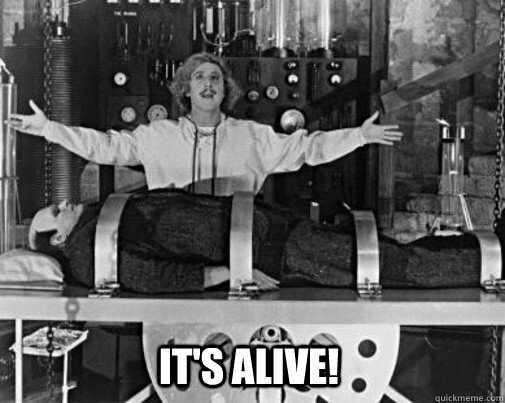 Can you believe we’re halfway through October? Just two weeks until Halloween. What are you dressing up as? Scroll to the VERY bottom of this post to check out the owner of our company in his costume. ANYWAY, one of my favorite things about this time of year is all the special treats, especially things made with apples. They’re SO good right now being as they’re in season. I can’t get enough apple cider, apple fritters, apple pie, apple cider doughnuts, and especially, caramel apples. They’ve been a favorite since I was a kid and I used to buy them all the time. Now that I know how to make caramel apples at home, they’re a favorite party treat, especially in the mini size shown here; what a perfect serving size! 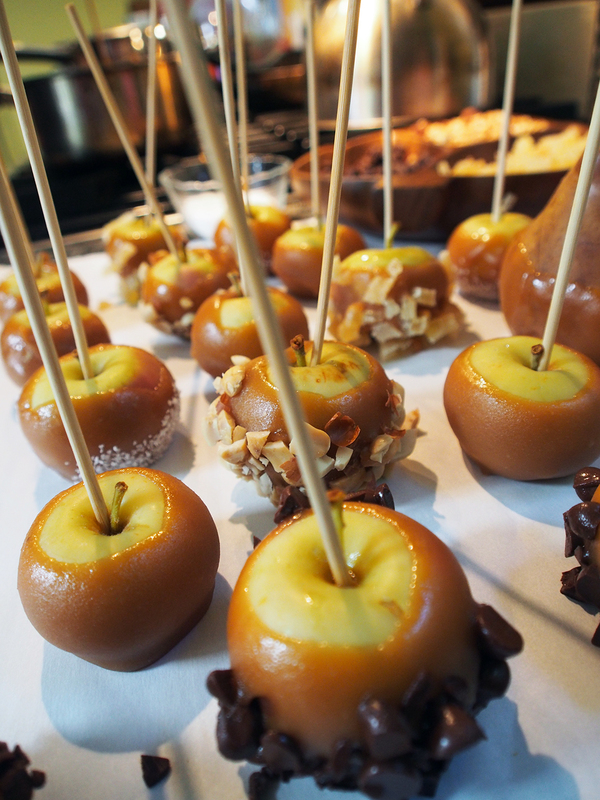 If you’re looking for a Halloween party food, a dessert buffet idea or just a fun lunchbox treat, consider making caramel apples! Read on for the caramel apple recipe and some tricks and tips, such as how to make the caramel stay on your apple! 1 large pinch sea salt. It’s honestly incredibly easy to make candy apples with the right ingredients, a little patience, and a little know-how. Really, it’s all in the prep. One of the most common pitfalls is making your beautiful caramel and having it slide off the apples. Why does caramel fall off your apples? 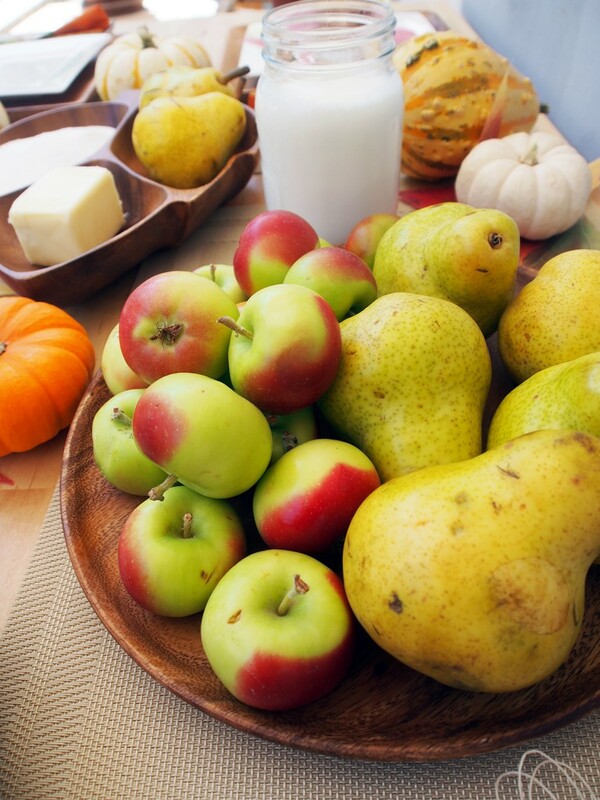 Simple – most commercially available apples are lightly coated in wax. To remove the wax, either scuff the surface of the apple with sandpaper or submerge apples in boiling water for about 30 seconds. Like magic, your caramel will stick. Dry each apple completely and put a stick into the stem end, making sure the stick is solid and secure. Hot caramel burns and you don’t want to be fishing your apples out with your fingers. Craft sticks work better on larger apples, but on our lady apples, wood skewers cut in half did the trick! Arrange your toppings in bowls. Fill them half to 3/4 of the way full with the toppings of your choice. Chopped peanuts are a classic candy apple topping but my favorite is diced candied ginger. SO spicy and nice for the fall. Also, prepare a tray lined with a piece of parchment paper or greased wax paper. This is where your finished apples will hang out to dry. Time to make the caramel! Add your corn syrup, half your heavy cream, your sugar and your butter to a saucepan, making sure the pan is half full at most. Cook over high heat until it is a rich golden color and measures 250 degrees on your candy thermometer. Remove from the heat and add the rest of the heavy cream, vanilla and sea salt, stirring to combine. The mixture will spatter and foam up. That’s normal, and that’s the reason you gave yourself extra room in the pot. Once all the cream and vanilla is incorporated, it’s time to dip. Dip and turn your wax-less apples in the caramel to coat completely. You may need to tilt the pan to get all the way up on the sides. Hold the apples over the pan and twirl them on their sticks, letting the excess caramel drip off, and back into the pan. While the caramel is still warm, roll in the topping of your choice and set on the parchment to cool completely. Keep going until you’ve run out of apples or caramel. If you end up with extra caramel, just spoon it into a Kilner jar and pop it in the fridge. Rewarmed, it’ll be amazing over ice cream or your morning yogurt. 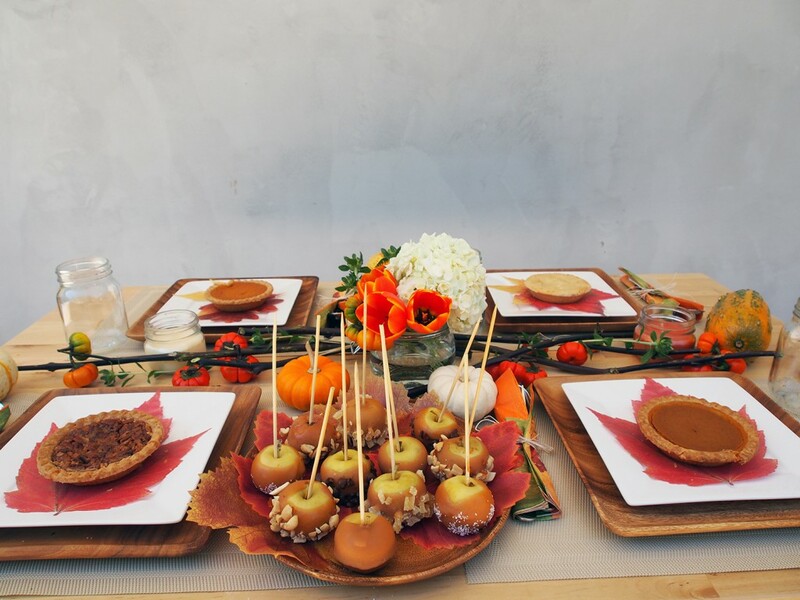 Items Shown: Delicious Caramel Apples! See? Not too hard. And those pictures are making your mouth water, right? 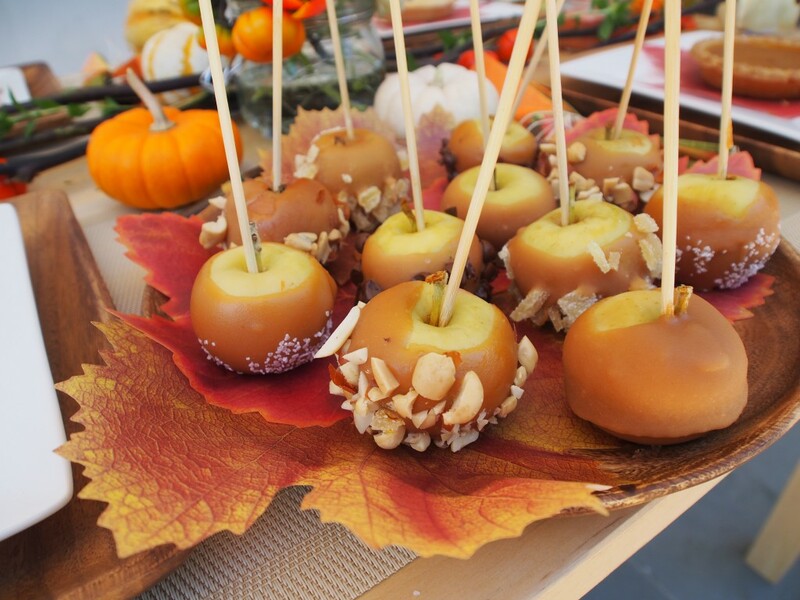 This time of the year, there are so many types of apples available, and they all make pretty good caramel apples. But, in my (totally awesome) opinion, the best kind of apple for caramel apples is either granny smith (that sour apple/sweet caramel contrast is amazing), golden delicious, or little tiny lady apples like the ones pictured above. If you’re serving bigger apples at a party (especially to kids with loose teeth) consider slicing them up for ease. The little ones are easy to bite into so you can skip slicing. And remember, these make a fantastic party favor. Put them in a cellophane bag and tie a ribbon around the stick for instant cuteness. 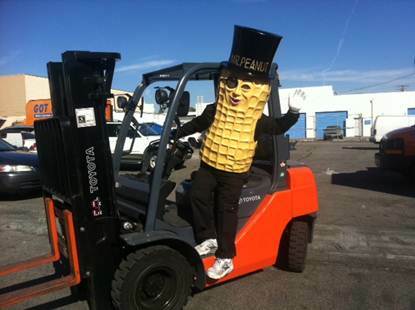 Oh yeah, I promised a picture of Bruce, President of Pacific Merchants, dressed up for Halloween. Because I ALWAYS keep my promises, here you go! He takes Halloween very seriously. Can you blame him? It’s the best. October is National Pizza Month. I mentioned it last year, but it’s been 12 whole months, and something as important as pizza shouldn’t go unmentioned. I mean, it’s pretty much the perfect food. Carbs, Dairy, Vegetables, Protein all in one easy-to-eat, delightfully delicious package. 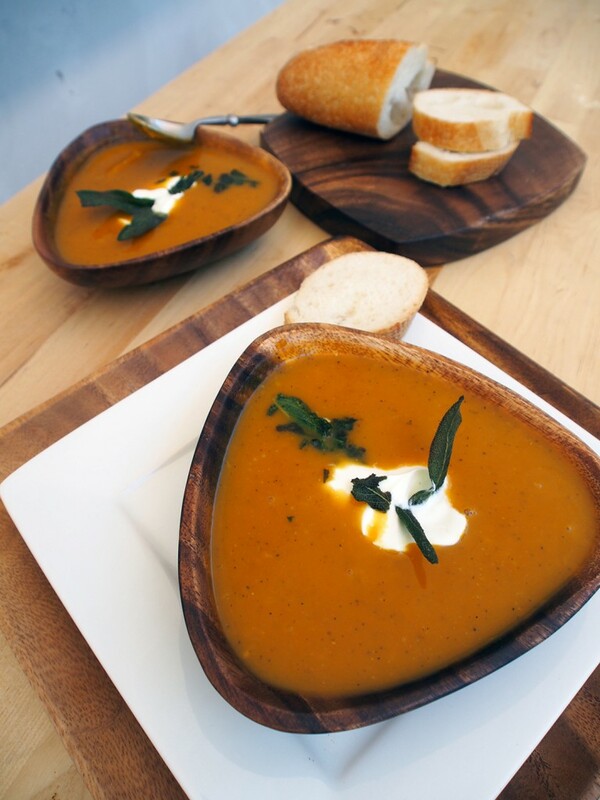 Now, this recipe is fine-tuned to taste like fall. If you want a more traditional pizza recipe, or if you’re looking for our signature pizza crust recipe, click on back to last October’s pizza post. That post also has some really good pizza tricks and tips if you’re looking to make an artisan pizza at home. It’s good to know. While pizza may seem like a plan B, homemade pizza is an AMAZING date night idea. Nothing brings people together like making something delicious together. Are you as psyched to make this pizza as I am? I thought so. OK. Here’s what you need. 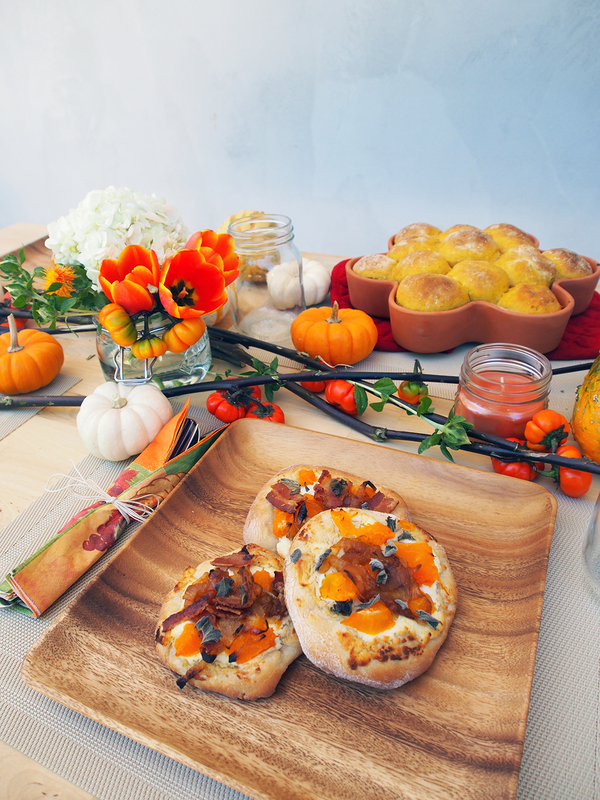 As you can see, it doesn’t take a lot of ingredients to make this festive fall pizza. Sure, it’s a little non-traditional. If you want something closer to the pizza you grew up with, you can always do a thin swipe of marinara and sub out the goat cheese for mozzarella. 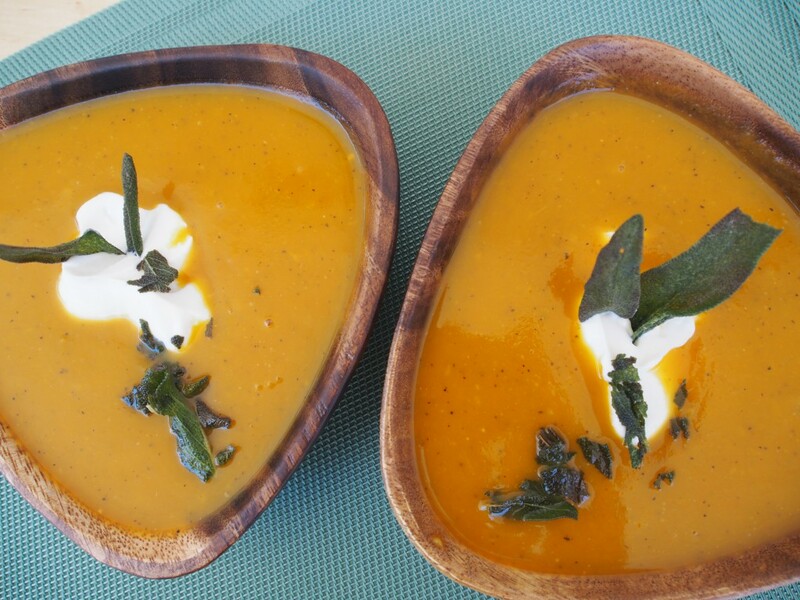 You’ll still have the fall flavors of the squash, but with a more traditional flavor profile. Figure out what size pizza you’re going to make. For this post, we made mini pizzas. If I’m serving this as an appetizer, I make one large pizza and cut it into small squares for my guests. If I’m trying to put together an impressive date at home, I set out an array of toppings and we each do personal pizzas. Pick your pizza size and divide the dough accordingly. Split in half for personal pizzas or in quarters for minis. When you’re sure of your portions and the dough is cut, cover it in plastic wrap and let it rest. And remember. . . 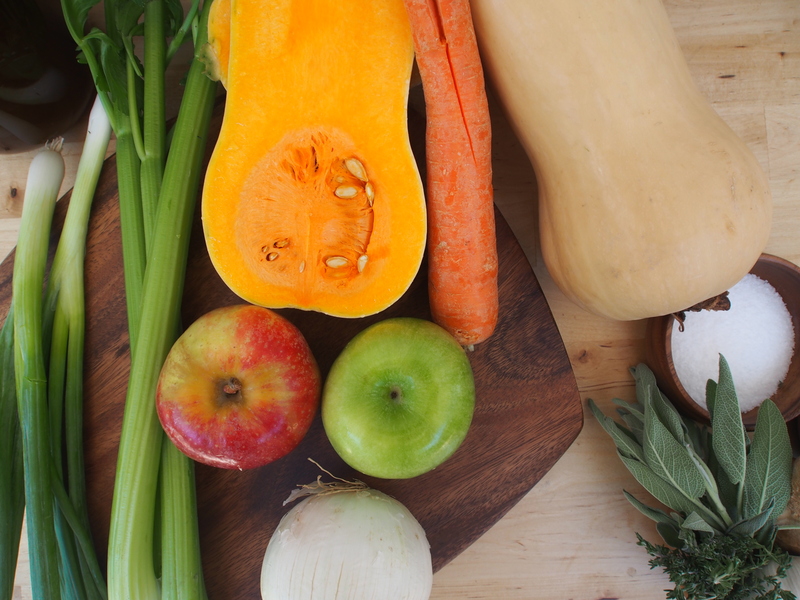 While that dough is resting (trust me – leave it alone) prep your veggies. Begin by caramelizing your sliced onions. Throw some oil in a pan, and when it’s warm, add the onions and a pinch of salt. Cook, stirring regularly, until onions are a beautiful rich brown, not unlike the color of our Acaciaware®. Meanwhile, cook up that butternut squash. You can roast it, steam it, or saute it. Just make sure it’s cooked until tender. Now is also a fantastic time to cook your bacon. You’ll be finishing your pizza in the oven, so you don’t want to cook your bacon until crispy right now, but cook it until the edges begin to crisp and the center turns opaque. You’re going for floppy, half done bacon. When it’s cooked, chop it up into small pieces. Heat your oven to 450. Lay out all your ingredients. The French call this mise en place, which literally means “everything in place.” I use an assortment of bowls and plates to hold everything within easy reach – a small bowl filled with sage leaves, medium bowls for onions, softened goat cheese, and squash, a plate for the bacon, etc. Time to make your pizza. Roll or stretch your dough to the desired thickness. Since you’ve let your dough rest, it should be pliant and not springy. Here’s a great tutorial on dough shaping from our friends at The Kitchn. Remember that since the dough is made with yeast, it’ll rise in the oven and will always be a little thicker than you roll it. Make sure there’s parchment or a ton of cornmeal between the crust and your baking sheet. Assemble your pizzas. Here’s how I like to do mine: Smear of goat cheese on the bottom, then a sprinkling of the squash (making sure there are pieces in every bite.) Next, scatter the caramelized onions over the pizza and drizzle with a hint of honey, a sprinkling of salt and pepper. Add on the bacon, and maybe a few more dollops of bacon and some freshly torn sage leaves. Bake until done. I know that sounds vague, but let me break it down: The mini pizzas took about 10 minutes in my oven. A personal pizza takes about 15, and a full sized pizza takes between 20-25. But mostly I go by sight. If the cheese is brown around the edges, and the bottom of the crust is golden brown all the way across, and there’s slight charring on top, I’m happy. Annnnnd there you have it, ladies and gentlemen. Now you know how to make pizza. 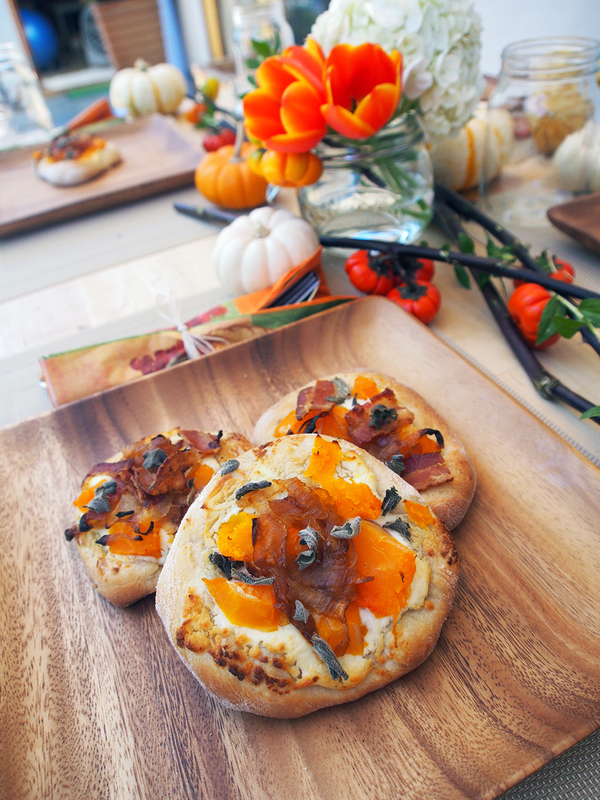 And not just any pizza, but a festive fall pizza that’ll make your tastebuds party. 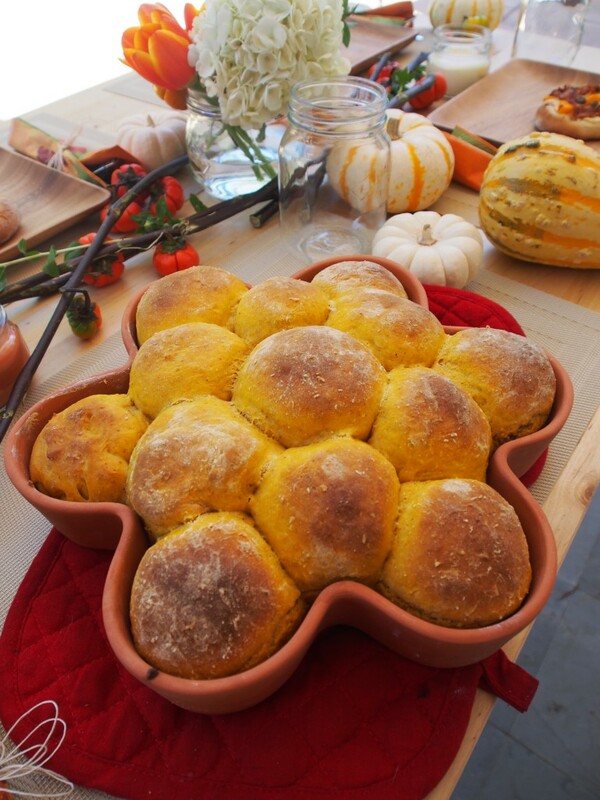 It’s a fantastic food if you’re throwing a Halloween bash, makes for a beautiful Thanksgiving appetizer, and is a pretty perfect weeknight meal, especially if you buy pre-made dough. 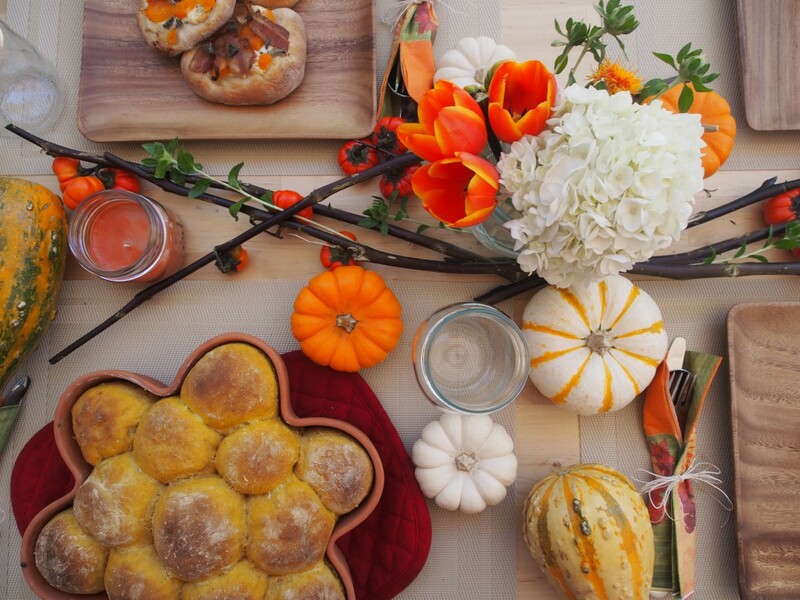 Check back in all month for more delicious fall foods and festive autumn ideas. 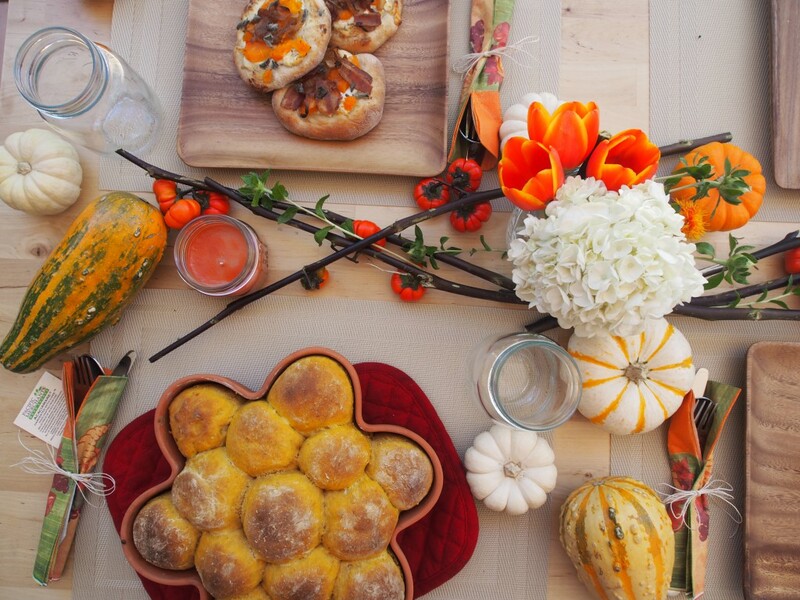 We’re covering everything from pumpkin bread (shown in the background of the above image) to caramel apples. Oh! 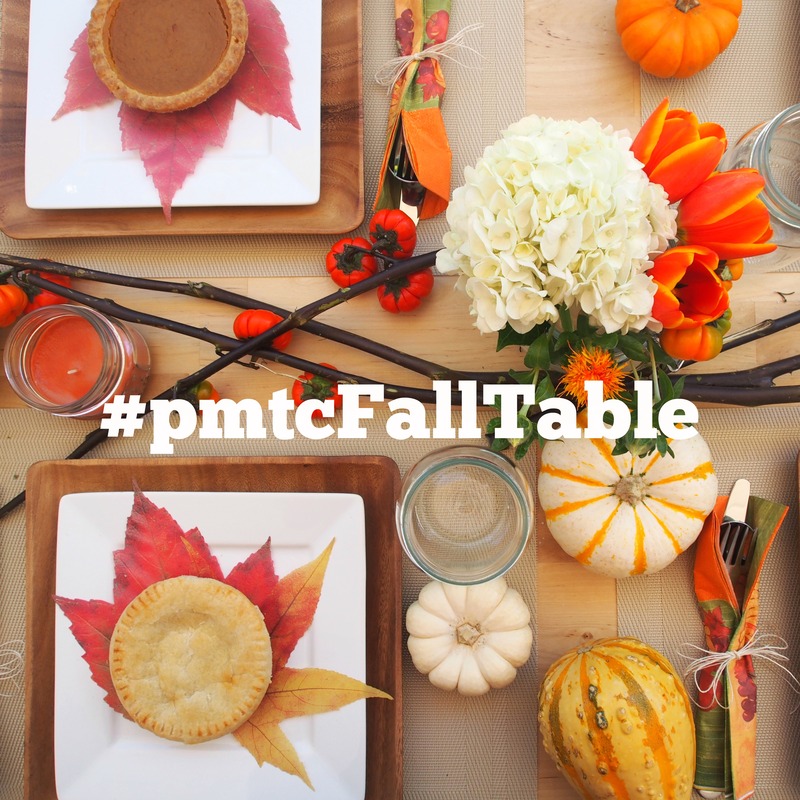 If you make any of these foods, or any other delicious fall treats, don’t forget to enter our #pmtcFallTable contest. Just snap a photo, post it to your favorite social media site and tag us. Or, if you want to enter but don’t want to cook, repost the photo below. For more details, click here! You’ve got until October 16 to enter!